Before you begin your daily fitness program, you have to warm-up. There is no secret formula and no need for specialized equipment; the main goal of a warm-up is to increase the blood flow to the muscles before you demand from them. Cold muscles are prone to injuries and tears, and it renders the exercises more difficult and less productive. 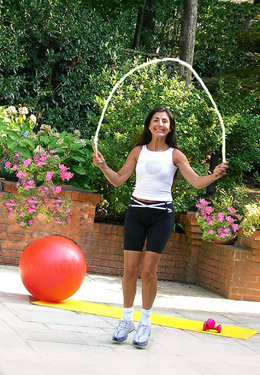 If the weather in your area permits it, choose a warm-up exercise that you can perform outdoors. You don't have to look any further than your own backyard or one of the local parks to enjoy the colors of spring, a crisp autumn morning, or the smell of fresh cut grass. Walking, swimming, and biking are all very good alternatives, but jumping rope and jumping jacks are unbeatable as the best options when it comes to a warm up that works on your posture. What's so special about both exercises? Not only are they great for warming up before a fitness routine because they recruit and activate all the important muscle groups in the body, but these two wonderful exercises repeatedly load the spine and the long bones of the lower extremities with additional weight during each jump. Thus, they strengthen the bones and reduce the chances for osteoporosis. Jogging is another good weight-loading warm up, but I don't recommend it for most people since the strain on the knees and ankles is much greater than jumping in place, and it can more easily lead to injuries or early arthritis. If you're not obese and you prefer to walk as a warm up, remember that you may benefit from wearing a backpack weighted with a few plastic bottles filled with water, to increase your weight. During the summer months you may enjoy having some cold water to drink or just to cool your back. Dump the water if it gets too heavy. Remember to be a little more careful not to fall when carrying a heavy backpack, because the additional weight raises your center of gravity and it decreases your stability when walking.